Some photographs from todays fantastic demonstration against gentrification, bringing together local campaigns on housing, rent rises in the arches, anti austerity, council cuts, library closures and much more. 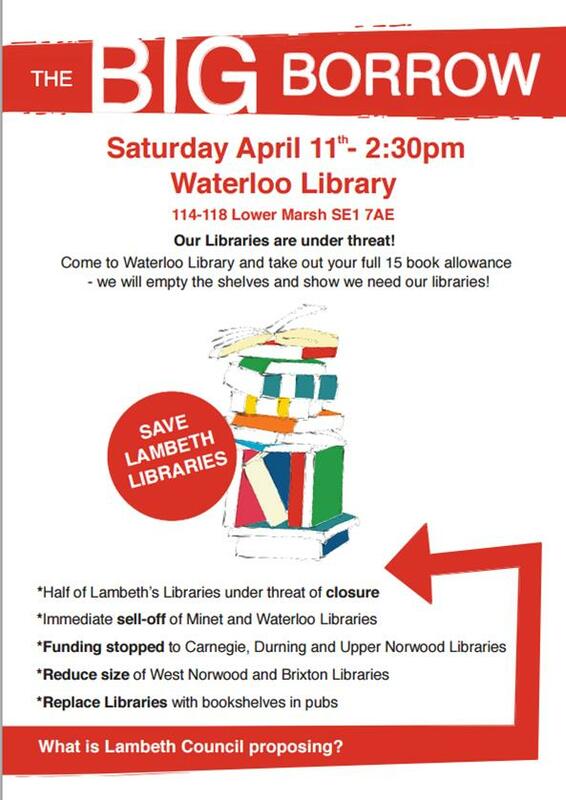 Lambeth Libraries are under threat! Come and join the campaign! Come to Waterloo Library and take out your full 15 book allowance, we plan to empty the shelves and show we need our libraries. You can sign up for a library card on the day, bring a proof of address (you do not need to live in Lambeth to join the library). There will be storytelling and face painting for children, on the day. Download our Big Borrow poster (PDF) (or in jpeg below) and stick it up at home/work/school/public noticeboards/shops to spread the word. Come to the library on Saturday and withdraw your full allowance with all your friends and family! 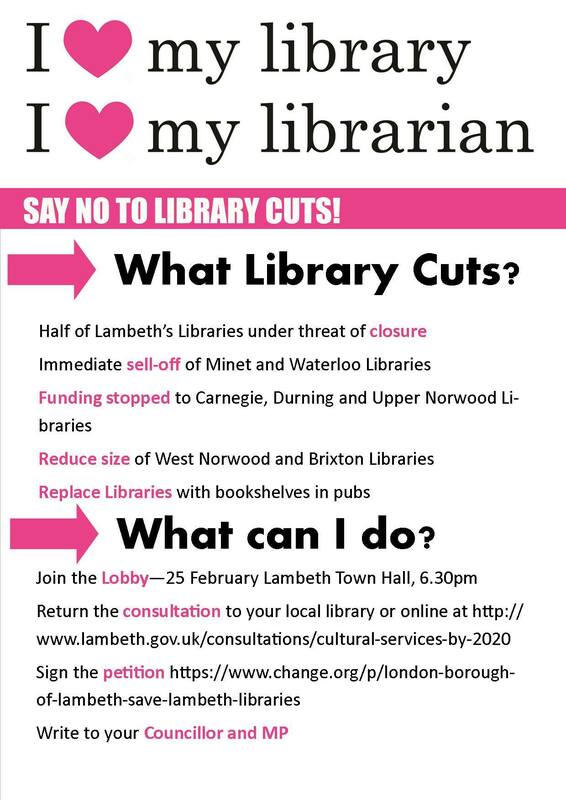 We called this meeting as Lambeth is consulting on massive cuts to our library service. Reduce West Norwood Library to a few bookshelves and allow Picturehouse to take over running it. The Labour Party in Lambeth rightly say, that there has been an attack from the government on Lambeth, our local services and communities like ours up and down the country. They say, given the scale of the ConDem cuts there is little as they could have done. They say they have to make a budget, they have to be responsible and that they have no other choice. One thing I would say to that, is they aren’t as they claim prioritising frontline services. One thing you can say about the cuts accross the public sector and the chaos caused by constant restructuring is that some people will get rich off the back of it. Here in Lambeth we have 17 employees earning in excess of £100,000. That is a pretty big senior management structure for an organisation which is haemorrhaging staff. In addition, there are 19 agency workers in the same pay bracket. There are another 132 agency workers on daily or hourly rates which are paid equivalent to over £50,000. Next time you are faced with a councillor saying they’ve done everything they can to save frontline services, tell them those figures. 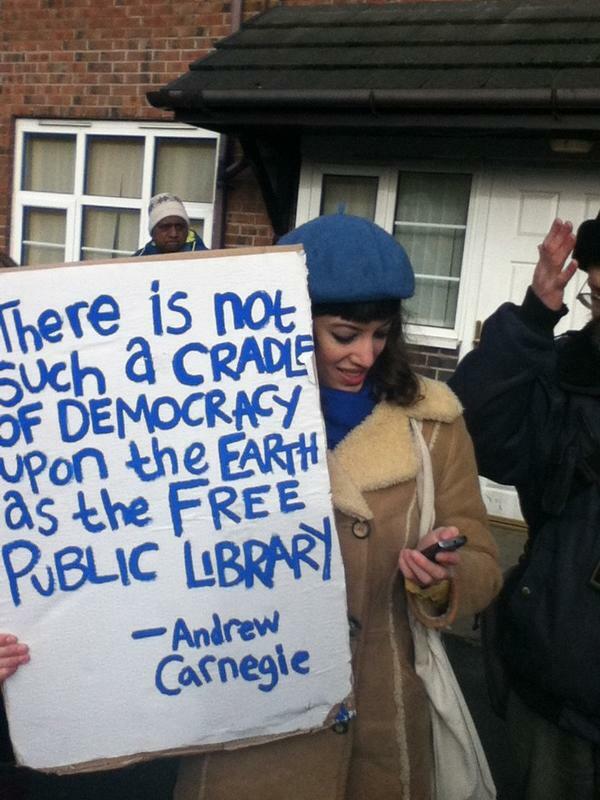 Ask them why they shut libraries and close day centres but pay for rebranding and consultatnts. But honestly that is not enough. There isn’t £90 million worth of waste and “jobs for the boys” in Lambeth. What’s the answer to “What more can we do? We are trying to protect you!” The answer from Lambeth’s trade unions is we want you to fight with us. You make a choice to pass on those Tory cuts without even trying to defy this government. They say “We have to do the responsible thing” – but when Labour Councils did the responsible thing when faced with the first round attacks and passed on the cuts to their communities, the government thanked them by making even deeper cuts. It is not responsible to sell off your libraries; to dismantle services which save lives and make life worth living. It is cowardly and it is disloyal to the people who voted for you. These cuts and closures will be enacted under the next government – it is a message that not only can’t they stand with us against the Tories they won’t stand with us under a Labour Government. It is not good enough. So we say to the Labour Party, stand with us, fight with us for this borough but if you can’t or you won’t we will fight on without you. I went to a meeting last week, where Cllr Edbrooke was speaking. Amongst declarations of how much it broke her heart to see the library service devastated by Tory cuts, she told us all how excited she was about the opportunities. It’s obviously very exciting devastation. And what she’s excited about is community libraries. So what services you receive now, doesn’t your community library have to offer? That might be better asked as, what does you community library have to offer? It doesn’t need to have free internet access; actually it doesn’t have to have free anything, in order to qualify as a community library. Community Libraries can, if they wish, charge for membership. They have fewer books – I have more books in my house than they had in The Railway Pub pop up library. It’s a lovely initiative, we should have more books in pubs but they are not libraries. They can charge for membership. They don’t have to have storytime and wriggle and rhymes sessions and if they do they do not have to be free. There are places all over Lambeth that charge £10 a child for rhyme times because that’s the way you cover the cost of putting them on. Don’t fall for the scam of community libraries, a cuddly name for the smokescreen put up to cover the closure of the service which belongs to your community and sits in your community and is an actual library – your local public library. This is the Council’s Outcomes budget – last year the council moved from funding services to funding outcomes. It is laid out as a very attractive Venn diagram. You may think when facing hundreds of millions of pounds of cuts, this kind of exercise, is somewhat rearranging the chairs on the titanic. I couldn’t possibly comment. Right let’s have a look at this – financial security, vibrant and creative town centres, skills to find work, opportunity for better homes, improved health. Yeah we do all that here. Literacy changes lives, a National Literacy Trust research paper showed that literacy has tangible relationships with educational attainment, economic well-being, aspirations, family circumstances, physical and mental health as well as civic / cultural participation. Honestly the amount it costs if you go into hospital, if you need mental health intervention, if you go to prison – everything we do here in this building and in the other nine libraries in this borough- is a bloody bargain. Even if libraries didn’t achieve all these outcomes. If it didn’t reap massive social benefits in terms of health, education and employment, I’d still be asking you to save our libraries. Because people enjoy reading and we shouldn’t have to justify every moment of our existence and pleasures in life by how much money someone can make or can save. We have the right to a bit of humanity – to find things out, to get lost in stories. Because books are where you can learn to be brave by meeting scary monsters who you can turn the page on; where you learn empathy by having other people’s feeling laid out for you, where you learn the world is not always as it has been and that it can change. What you read and have read, effect the kind of parent, friend or lover you’ll be and teach you all kind of skills you don’t even know you are learning. Reading is a right. Accessing libraries is a right. Is it a right because it is covered by statutory legislation – maybe. Is it a right because UN enshrines the right to participate in cultural life – possibly. Much more important than either these – it’s a human right because I said so, and because these people say and because you say so. Like every right in life it’s won by people demanding it and fighting for it with all they have. Join HASL and Fuel Poverty Action on Tuesday 8th July, 6.30pm at Art Nouveau, 77 Atlantic Road, Brixton, SW9 8PU to learn about our energy rights, how we can enforce these, and how we can take action together for warm homes for all. It’s summer – but people are struggling to pay rip-off energy bills year round and with winter around the corner, it’s a good time to get clued up on our rights, how we can support each other with our energy issues, and discuss what action we can take together to combat fuel poverty in our communities. A recent article in a Glasgow newspaper showed that people visiting the local food bank were using camping stoves indoors to cook food because they couldn’t afford their gas and electric bills. People cannot afford to cook their food and lives are endangered as people resort to desperate measures such as camping stoves to get warm food. Please find our poster below and spread the word! Lambeth Housing Activists will be leafleting the estate to try to get support for this protest. A night of films celebrating the struggle for decent housing in our communities (part of the Radical Housing Weekender). As the housing crisis in the capital deepens – with homelessness on the rise, one in ten London homes overcrowded, rents far outstripping earnings, and private landlords running amok – join us at St. Matthew’s Tenants Hall for a reminder of what can be achieved through collective action against these problems. We will be showing a series of short films which give an insight into housing activism, past and present, and aim to provide acknowledgement and encouragement both to those who are precariously housed and those fighting to combat this social ill. The films will show contemporary projects, such as the campaign to save and expand social housing in Cressingham Gardens, and inspirational historical examples, such as the co-operative living spaces established by the Brixton Faeries in the 1970s. In addition to the short film screenings, there will be an opportunity to hear from activists and local residents and, most importantly, for discussion. There will be people from a number of different housing campaigning organizations in Brixton the E15 mothers a group of 29 young mothers organising’ to stop the hostel they live in being closed are coming to say a bit about their campaign. We will more during the week. The films should be interesting but just as important is the opportunity for us all to spend some time socializing and having fun. There are drinks at the bar. Come and show support for a HASL member’s bedroom tax refund. We’ve had enough of being messed around by the housing office! 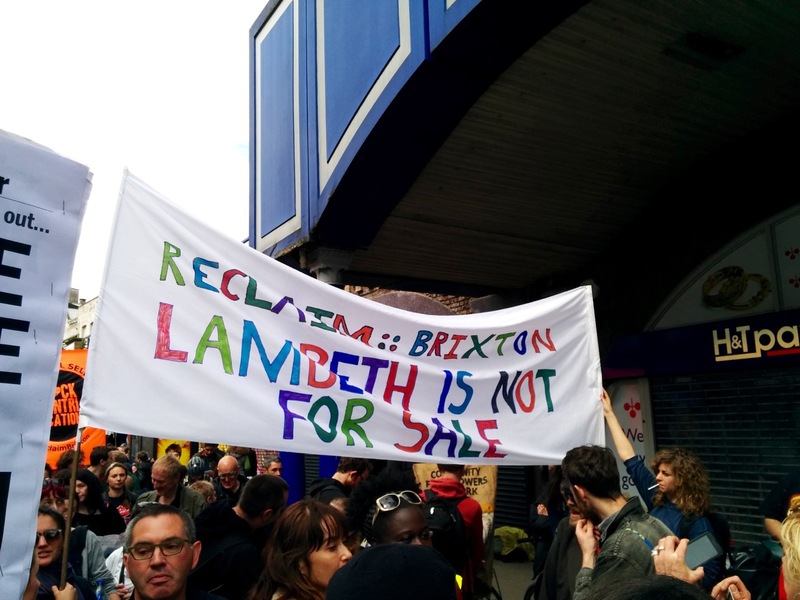 Join us on Friday 25th April, 11:50am meeting outside Brixton Customer Centre, Olive Morris House, Brixton Hill. Bring friends, family, neighbours! Ellen is due a refund of the bedroom tax that she has been forced to pay for a year now, as she meets the criteria for the bedroom tax loophole. However, the housing office have not been all that helpful in getting this refund back to her. The housing office have taken over a month to respond to our appeal letter and we only received the unfavourable response after chasing them up about this. The response gave very little detail or evidence of why this negative decision had been made. The bedroom tax (one of many brutal welfare and housing cuts) is causing great hardship to the hundreds of thousands of people it is affecting. The refund offers a tiny respite from this stress and suffering by returning a small sum of money that should never have been taken off of them in the first place. It takes little effort from the council and will make a huge different to the people who receive it. Join us to make our challenge at the housing office to demand the bedroom tax refund for Ellen and that our dealings with the housing office to be met with more respect.